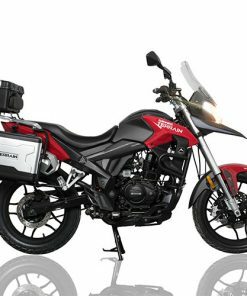 A mega scooter designed and manufactured for urban and intercity travel with a powerful 4 valve liquid cooled 125cc electronic fuel injection engine made in Europe. A sporty and elegant design that makes a difference, combined with high quality components and a first class finish.When you’re riding, everything is in place, intuitive controls, precise and agile handling, it’s even easy to handle at stand still. The advanced geometry design combined with a tried and tested wheelbase and lightweight structure provides a sporty yet secure ride. City driving is a breeze thanks to its power to weight ratio and easy handling. With lightweight 14″alloy wheels and low profile tires the City Line provides great rider feedback with a precise sense of control.Available in two colours, the Rieju City Line in black appeals to those who prefer sharp racy lines, whilst the softer metallic grey version with contrasting panels is perfect for the fashion conscious city dweller.For commuting, free time shopping, or movement between the masses, Rieju City Line is your ideal 125cc scooter taking you wherever you want. Under seat storage offers room for two helmets, front glove box with built in phone charger allow you to travel with all you need and always arrive with some charge! A low seat height offers safe and secure handling at low speed and during parking. The braking system features 260 mm discs at the front and 240 mm in diameter at the rear, both are wave type for faster heat dissipation for improved feel and braking performance under all conditions.All components are high quality and will provide all the necessary information and features for everyday use. On board computer with air temperature, clock, odometer with journey time and trip meter. Plus a stylish set of analogue clocks indicate speed, engine temperature and tachometer. Other luxury touches include illuminated under seat storage area and USB charger as standard. 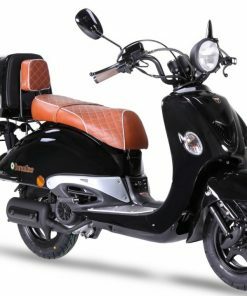 Bringing luxury to the high-level scooter sector.The powerful 125cc 4 stroke , 4 valve, water cooled, electronic injection motor offers excellent fuel economy, low service requirements and great reliability expected in the luxury commuter sector. Being manufactured in Europe the engine promises the maximum allowed performance 11kw (15HP) whilst complying with latest European emission standards. 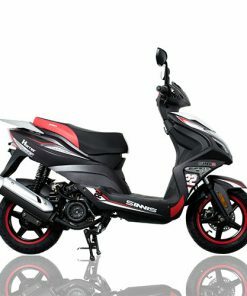 By purchasing this genuine Rieju CityLine 125i ABS from Biking Direct, you are purchasing via an authorised Rieju distributor. We only sell GENUINE Rieju Products so you can have peace of mind. Whether its developing our own armour system, sourcing new and unique materials, thread or zips, or producing innovative products such as the Rieju CityLine 125i ABS, if there is a better way to do something the team is always striving to push forward and improve. 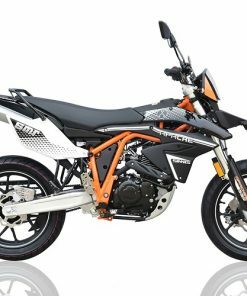 Buy with confidence, buy with Biking Direct. DIAM x STROKE 57,0 x 48,6 mm. FRONT SUSPENSION Hydraulic forks of Ø36mm. DISTANCE BETWEEN AXES 1.410 mm.